So I mentioned on Tuesday that there wouldn’t be a post yesterday but I hope this one makes up for it. One of the very first pins I pinned was something I have always wanted to recreate. When I spoke to Madness Nails about it she happened to have recently done the very same thing. After we laughed about it we decided to use the opportunity to do twin nails. Using the same inspiration. So here we are. 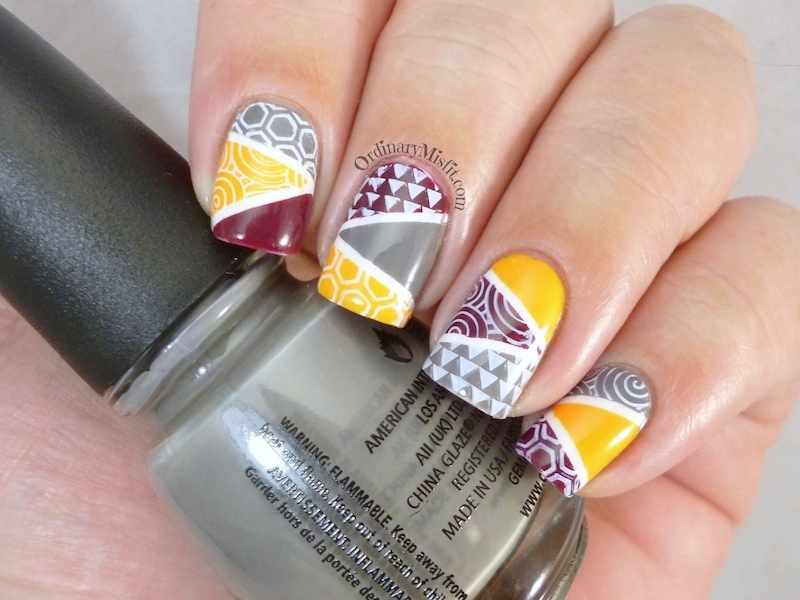 The inspiration for this was this geometry nails post from The Polish Project. I am such a fan of The Polish Project in general. So many of my pins are from Jen. I might actually get the courage to do them all now 😉 So here is my version and as soon as Madness Nails posts hers I will share the link here. *edit* Have a look at Thea’s version. I started with 2 coats of Sinful Colors – Snow me white on all my nails and left that to dry completely. 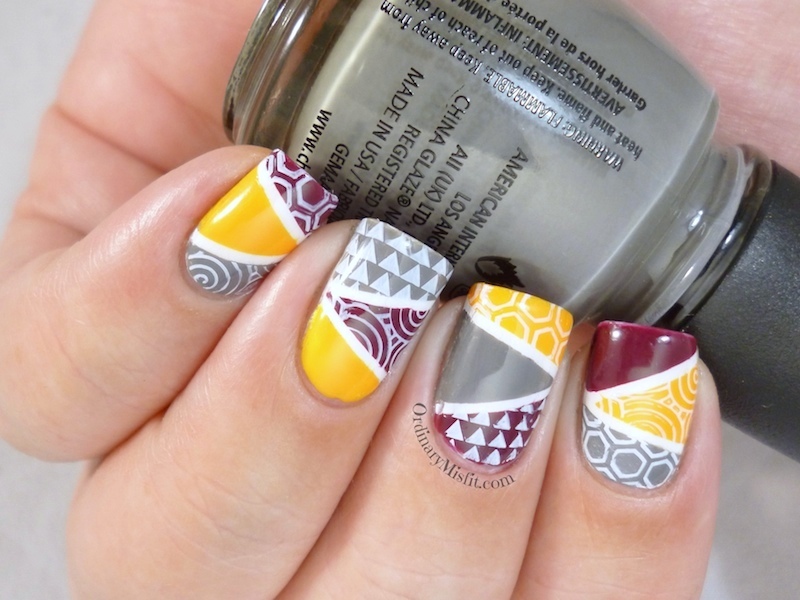 Once it was dry I taped off the sections with striping tape and then filled it in randomly with Sinful Colors – Anchors away (yellow), China Glaze – recycle (grey) and China Glaze – Purr-fect plum. I did one nail at a time and immediately removed the tape once it was done. I then top coated that and left it to dry again. Once that was dry I taped off the section and stamped using Essence – Stampy polish in white and plates BM423, BM422 and Pueen13 and then top coated it all again. This was a little time consuming as their was a lot of drying time involved. I absolutely loved it though. I am not sure if it comes close to the ‘original’ but I loved it. I also really love the colour combination (thanks anarchy girls). You’ve already seen Sinful Colors – Anchors away here so I will show you the other colours. This is 2 coats with no topcoat. Recycle is a medium grey creme with a great formula and opacity. I actually really love this grey much more than I thought it would. This is 2 coats with no topcoat. A beautiful juicy plum creme with buttery formula and great opacity. This is the perfect winter shade. Don’t forget you can find all the swatches as I post about them under the ‘Swatches’ tab – including the stamping swatches. Hover over it in the menu above and you can find them by brand. What do you think of this? I am so excited to FINALLY have done twin nails with T (Madness Nails). Don’t forget to check hers out as well. This is AWESOME! You freaking rocked it bok! Love! Thea Madness! recently posted…Twinsie…Thursday? Kind of! Thanks so much Bok. So did you!!!!! Thank you so so so much V! OMG M! too insanely gorgeous! MeganTS recently posted…Glow Mofo Glow! So beautiful, so clean, very different, I love it! Thank you so much Yana! Whoa! This looks like so much work I’d be mighty scared of, haha.